Thomas A. Sporkin is a partner at the law firm BuckleySandler LLP. As a former senior SEC enforcement official, Mr. Sporkin brings unique experience and insights to the individuals and businesses he represents in matters before the SEC, FDIC, CFPB, FINRA, CFTC, FinCEN, and other financial regulators. Mr. Sporkin has broad subject matter expertise across all SEC program areas and continues to monitor key developments at the SEC and other bank and financial regulatory agencies. His practice focuses on compliance counseling, internal investigation, private litigation, and enforcement defense. 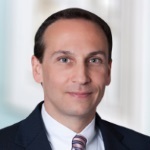 Mr. Sporkin has particular experience with whistleblower matters, having been one of the leaders in launching the SEC’s Whistleblower Office and writing the whistleblower rules called for by Dodd-Frank Act. Drawing from his experience and insights, he is often called upon to advise financial institutions and public companies on sensitive whistleblower issues. Before joining BuckleySandler, Mr. Sporkin spent 20 years with the SEC’s Enforcement Division, most recently as Chief of the Office of Market Intelligence where he oversaw a multidisciplinary staff of more than 50 senior enforcement attorneys, accountants, market surveillance specialists, and analysts tasked with identifying and investigating conduct that could give rise to violations of the federal securities laws. Prior to running OMI, Mr. Sporkin co-managed a staff of 20 enforcement lawyers overseeing investigations into the Foreign Corrupt Practices Act (FCPA), financial fraud, insider trading, and manipulative trading. In 2009 and 2010, Mr. Sporkin was selected to be one of the leaders of two cutting-edge initiatives: the launch of the SEC’s Whistleblower Office and the launch of the Consolidated Audit Trail rule writing effort. While at SEC, Mr. Sporkin was involved in numerous investigations resulting in the SEC charging individuals and entities with stock fraud, insider trading, bank secrecy act violations, and FCPA violations. With his broad experience, Mr. Sporkin is often invited to comment on new regulations, hot topics, and ongoing regulatory matters on television and in print media. Mr. Sporkin is an adjunct law professor at the George Mason University School of Law and the Catholic University Columbus School of Law. He serves on the Law and Advisory Council at the University of Albany’s Institute for Financial Market Regulation and is a former co-chair of the Intelligence Subcommittee of the DOJ Securities & Commodities Fraud Working Group.